This week was the big theme park trips. I hit up all 4 Disney Parks on one day and the 2 Universal Parks on another. It was an exhausting couple of days, but so completely worth it. In order to hit all 4 Disney Parks in one day, I did stay at the Pop Century Resort. It actually cost about the same as the close budget hotels when including parking costs. It also gave me an extra hour at the parks that was so valuable in getting all 4 parks done. The resort was probably one of the nicer hotels I’ve stayed at, and the concierge was really helpful in giving tips for which attractions were must sees at the different parks. I didn’t want to over-plan and end up disappointed, so I made one goal of something I wanted to see or do at each park. My Disney day started at 5:40 with the shuttle to Hollywood Studios. The extra hour started at 7am, and even getting there at 6, there was already a small line. My goal for the park was to ride the Slinky Dog Dash. I was on the second trip for the roller coaster, and it was great. Since it’s a metal coaster, it was a lot smoother and a little more thrilling with maneuverability than a lot of the wooden coasters. 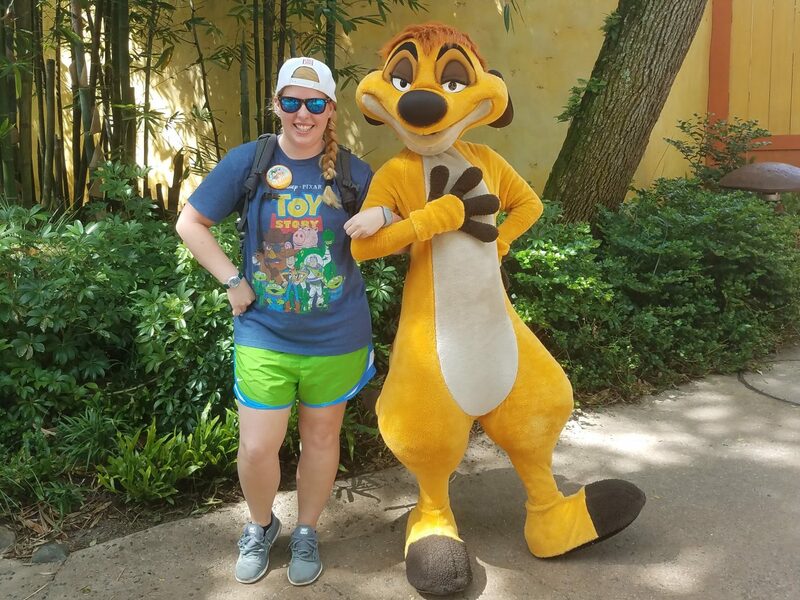 I also got to meet several different characters throughout the park, and there were almost no lines to meet them during the extra magic hour. Looking back, I could have spent a little more time at the park, but I didn’t know it at the time and didn’t want to spend too much time and not have time at the other parks. I left Hollywood Studios at a little after 8 and arrived at Animal Kingdom a little before 9am. I did not make the best use of time when I got to Animal Kingdom. My goal for the park was to go to the Festival of the Lion King show. Instead of making use of the first hour at the park, I decided to wait to make sure I got in and had a good seat for the show. Looking back, I definitely should have tried to go on the safari trip or done something else with that first hour. There were tons of open seats for the show, and I could have arrived right at showtime and still gotten a good seat. However, the Festival of the Lion King show was amazing. The performers, the costumes, the whole experience was amazing. After the show, I walked around and explored the park a little bit. All of the different areas of the park were beautiful and the whole atmosphere was great. I did end up going to 2 more shows: It’s Tough to be a Bug and Finding Nemo the Musical. They were both alright but were not nearly as spectacular as the Festival of the Lion King. I stayed at Animal Kingdom way longer than I had intended to, and I probably would have skipped the Nemo show if I were to do it again. The wait for the shuttle bus after Animal Kingdom was also way longer than normal, so a little bit of an extra delay. I left Animal Kingdom around 1pm. My third stop was Epcot. I got to the park around 2pm, and it was raining. I knew that rain was a possibility, and I had planned on grabbing lunch while it rained. However, I had not planned on the walk to wherever I was eating being as long as it was. I ate in the Mexico section of the World Showcase, and then started making my way around the rest of the showcase. My goal for Epcot was to meet Baymax and a Disney Princess. The first princess I passed was Snow White, but she had too long of a line to wait. I ended up meeting Jasmine. Not only was her line a little shorter, but it was also inside which was nice since it was still raining off and on. The whole showcase was really neat, and I think it would have been cool to explore each section more if I had had more time. Because I had spent so much time at Animal Kingdom, I also was a little more concerned with time. I didn’t really explore the future section at all, and there are definitely things I missed that I would like to have done. As for meeting Baymax, I did see him and fully planned on waiting to meet him but decided not to last minute. The costume for Baymax did not appear very mobile, so it didn’t look like it would have been a good experience. I left Epcot around 5pm and took the monorail to the Magic Kingdom. The Magic Kingdom was everything I could have hoped for. My goal for the Magic Kingdom was to watch the fireworks show, so I had quite a bit of time to explore before that. The different sections and atmosphere was just amazing. I went to story time with Belle, met Tinkerbell, and just enjoyed walking around the park. I also ended up going on the Big Thunder Mountain Railroad rollercoaster which was a lot of fun. There were shows happening all throughout the park, and I stopped and watched part of several different shows that were happening. My last stop of the evening was the fireworks display. I got there pretty early, and I was not disappointed. The music and story that went along with the show was fantastic. The show hit on so many favorites and definitely made me want to rewatch all my Disney favorites and take another trip to the park. It was the perfect ending to a wonderful and exhausting day. My day at Universal Studios did not start nearly as early. I left the hotel around 7am and drove to get breakfast and go to the park. I got there around 8am (an hour before opening) and got a good parking spot. I started off my day in the Islands of Adventure park but went back and forth between the 2 several times. I was a little surprised at how much of the Universal park is not Universal. It almost felt like an “everything but Disney and maybe even a little Disney because of Marvel park.” I did go on a lot more rides at Universal, probably more than I’ve ever gone on anywhere before. I found that I really enjoyed a lot of the simulation type rides, and Universal has a lot of those. The simulation rides (and Revenge of the Mummy) were all inside as well which meant that they were still operating even though it rained for a lot of the day. I did really enjoy the Wizarding World part of the park (even though it’s really split between the 2 parks). The feeling and world that was created definitely felt like being in Harry Potter’s world. In general, though, the atmosphere, characters, and shows were no where near as good as at Disney, but the rides were better and the food was better and cheaper. There were a lot of things in the park that you also still had to pay to do which was a little strange because of how much it cost to start with. Overall, I did enjoy my day at Universal, and wouldn’t mind going back to the Wizarding World, but it didn’t quite blow me away in the same way that Disney did. This was one of the more expensive and exhausting travel weeks I’ve had since starting this journey, and overall it was well worth it. I’m looking forward to the travels I have planned in the next few weeks, but also maybe relaxing a little bit as well.